It has been said that while Lalaji was in a super-conscious state contemplating a successor to take forward his spiritual work, the form of Ram Chandra of Shahjahanpur appeared to him. Lalaji started transmitting his own spiritual condition to his presumed successor, thus attracting this special personality towards him. Ram Chandra later became Lalaji’s spiritual representative and was affectionately known as Babuji to thousands of his devotees. Babuji was born in the North Indian town of Shahjahanpur, in the state of Uttar Pradesh, on 30 April 1899. He was named Ram Chandra after one of the great figures of Indian history. His father was a lawyer and noted scholar who educated Ram Chandra extensively in English, Urdu and Persian, perhaps hoping that his son would follow in his footsteps. But from an early age Ram Chandra displayed a craving for spiritual realization which overshadowed all other interests. Ram Chandra became a babu, which in his native tongue designates a clerk, and it was from this profession that his affectionate nickname, Babuji, arose (the suffix ‘ji’ is an expression of respect often appended to names or titles in India). He held the position of court clerk in the district court of Shahjahanpur for more than thirty years. He was married at the age of nineteen and his wife, Bhagwati, bore him two daughters and four sons before her death in 1949. Babuji’s life was that of an ordinary householder, never that of a renunciate, or sannyasi. He considered the home and family to be the finest training ground for spirituality, and it was in this light that he approached his familial responsibilities. He began his spiritual education on his own, experimenting with the forms of devotion available in the Hindu religion and with certain yogic practices such as pranayama (the control of the breath). In June of 1922, at the comparatively young age of twenty-two, he met his spiritual Master, a man with the same name as himself who lived in the town of Fatehgarh, not far from Shahjahanpur. Ram Chandra of Fatehgarh, affectionately known as Lalaji, was considered a saint of the highest calibre. He recognized Babuji as the man who had appeared to him in a dream years before, the one who was destined to succeed him as the leader of the great spiritual renaissance which he, Lalaji, had already initiated. Though there were very few meetings between teacher and disciple before Lalaji left his physical body in 1931, Babuji was in perpetual remembrance of Lalaji and insisted he could not live for a second without his Master’s inner guidance. Carrying forward Lalaji’s spiritual legacy became the singular mission of Babuji’s life. His conversation was punctuated by Lalaji’s name, and no honour that Babuji could show his Master was enough to express the great love that existed between them. Babuji believed that spirituality is the birthright of all and that it should be offered freely to sincere seekers everywhere. He defined the ultimate goal of human life as a condition of complete oneness with the Divine, insisting that this is attainable in a single lifetime for any sincere seeker, given an effective practice and the help of a capable living Master. He believed that a true Master is the ultimate servant, and he lived his life serving all, irrespective of cast, creed, religion, gender or nationality. He taught that material and spiritual life should go hand in hand, like the two wings of a bird, and that the normal life of a householder is the best environment in which to learn the twin virtues of love and sacrifice. Accordingly he simplified and perfected the spiritual system of raja yoga so that ordinary people could practice it and reach the spiritual goal. He advised his followers not to be discouraged by their faults and shortcomings, but rather to treat their weaknesses as belonging to the Master and proceed with their practice. This, he said, would contribute to steady spiritual progress. Likewise he advised letting go of mistakes, resolving not to repeat them but otherwise forgetting about them. When we dwell on past regret, he said, we intensify the impression and give it more influence over our lives. It is in the present that we develop our character and thus create a brighter future. Babuji was by nature the humblest of people, yet moved by a vast pride in his great Master. The communication established between the two men after Lalaji left this world continued throughout Babuji’s life and filled his diaries with both astonishing visions into the nature of reality and practical instruction on how to lead a spiritual life. He was perpetually striving for balance, to be neither pleased by good words nor displeased by bad; to maintain a temperament of humility but to avoid the habit of excessive modesty. It was his conviction that the ego, being the production of God, could not be annihilated. Rather, through utter surrender and devotion to his Master, he was able to modify the ego, identifying it not with the body but with the soul. 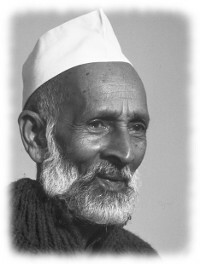 Following Lalaji’s departure, Babuji began travelling throughout India using the gift of transmission, or pranahuti (a yogic technique rediscovered by Lalaji and passed on to Babuji as the basis for the Sahaj Marg system of raja yoga). He would go alone to places where he had no friends or acquaintances, tour the city or town transmitting divine energy, and then leave without a word. The fruits of this labour are now visible in the widespread network of Sahaj Marg centres throughout India. In 1945, Babuji founded the Shri Ram Chandra Mission in honour of his Master. Convinced that God is simple and can be arrived at by simple means, he was confident that seekers of every culture and nationality would embrace the simple and effective spiritual practice that he offered. In 1972 he began taking the method of Sahaj Marg to countries outside India, bringing it to the cultures of Europe and America. He was accompanied on these travels by his attendant and long-time general secretary of the Mission, Shri Parthasarathi Rajagopalachari of Madras (Chennai). Parthasarathi, known to his associates as Chariji, was later chosen by Babuji to succeed him as his spiritual representative and president of Shri Ram Chandra Mission.